Mocked and Belittled For Acts of Kindness? The very definition of kindness is to give without expectations of a return. It doesn't matter if they deserve it or not. I do my best to always be kind to others, for this action I've been called weak, stupid and gullible among other such colorful adjectives. Do people like me get taken sometimes sure, do we want to be taken of course not, will we let it stop us from acts of kindness? No why should it? 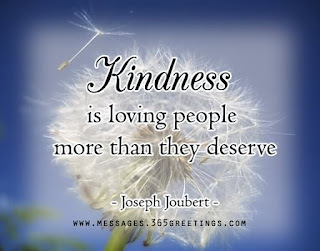 If you are disposed to be kind you don't do it because the other person is or isn't worthy of your kindness. You do it because that is what your heart tells you to do and you can never go wrong where being kind is concerned. It doesn't matter if the other person is worthy of that kindness what does matter is that you are worthy to give it.